William Shatner is to receive the NRHA Dale Wilkinson Lifetime Achievement Award. Canadian actor William Shatner – known for his roles in Star Trek and Boston Legal – will receive a Lifetime Achievement Award from the USA’s National Reining Horse Association later this year. Shatner will receive the NRHA Dale Wilkinson Lifetime Achievement Award on November 28 during the NRHA Futurity in Oklahoma City. Well-known as a horseman, Shatner, 87, cultivated a career spanning more than 50 years as an Emmy and Golden Globe-winning actor, director, producer, screenwriter, recording artist, and author. Shatner’s passions for horses and philanthropy were united through his involvement with Ahead With Horses, a charity organization that gives physically and mentally challenged children the thrill of riding a horse — and boosts their confidence and self-esteem, often with life-changing results. For more than two decades, he has hosted the Hollywood Charity Horse Show at the Los Angeles Equestrian Center. The event benefits Ahead With Horses and other Los Angeles-based charities. Additionally, he has been a high-level promoter and fundraiser for the sport of reining, participating in a host of charity events. William Shatner at the Hollywood Charity Horse Show several years ago with a little girl who was able to take her first steps as a result of Ahead With Horses. When the FEI World Equestrian Games came to US soil, he and his wife, Elizabeth, supported the event at a high-level and cheered on reining teams from around the globe. Not only has he raised thousands of dollars for various charities, he has introduced reining to other celebrities, as well. Tim Allen, Willie Nelson, Sarah McLaughlin and Neal McCoy are just a few of the people who have performed at the reception with the Hollywood Charity Horse Show and have been exposed to reining, thanks to Shatner’s devotion to the sport. Shatner also has been successful as a breeder and exhibitor. A longtime dedicated breeder of quarter horses, he has had smashing success with the beautiful American Saddlebred, developing and riding world champions “Sultan’s Great Day” and “Revival.” He has won numerous world championships in several equine events. 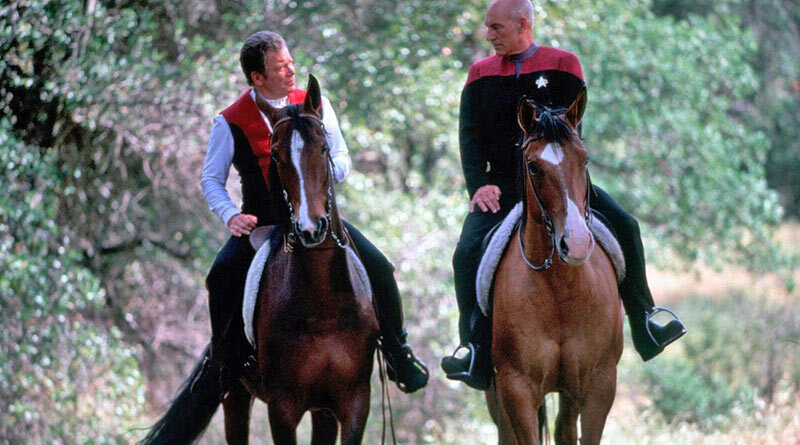 Shatner continues his involvement with film and television while still managing to find time to work with charities and further his passion for the equestrian sports. He and his wife and three adult children live in Los Angeles. This award is named after the legendary reining horse trainer known as the “father of reining,” Dale Wilkinson, the first inductee into the NRHA Hall of Fame. Wilkinson is a multiple NRHA Futurity champion and one of the founding members of the NRHA. William Shatner, right, with DeForest Kelley and Grace Lee Whitney in Star Trek, in 1966.